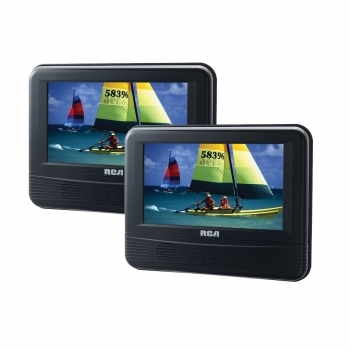 Enjoy seamless movie watching with the DRC69705 dual screen mobile DVD system by RCA. Take the player with you wherever you go - the park, in the car, to the beach - anywhere. The seven-inch screen mobile DVD player features an additional screen so you and your friends can comfortably enjoy a movie together. You'll experience smooth video playback with the electronic skip protection. The 7 inch Dual Screen DVD System features built-in stereo speakers, a headphone jack, and AV input and output jacks. Included with the mobile system are all the accessories you need to setup the players in your car including the headrest mounting kits and a car power adapter. Also included are a remote control and an AV power cable.